Message 617355 - Posted: 10 Aug 2007, 2:29:10 UTC - in response to Message 616775. Dang it, so where was the party!!! Post Office was again delivering the party message, hate when that happens. Message 617361 - Posted: 10 Aug 2007, 2:49:24 UTC - in response to Message 617358. A party and I'm not there-what a shame.....sheesh. Message 617365 - Posted: 10 Aug 2007, 3:00:57 UTC - in response to Message 617363. I'm with ya there Blurf! What's a party without everyone! I'll share with you one day the pre-wedding party for my brother and his to be wife and her 'family' meets our 'family' for the first time. We're from, guess, Philly and their from West Virgina. Bring your favorite beverages, bring your pot luck food, (Bratwurst, Italian Sausage, Polish Hot Links, etc. ), and I'll make my Five Alarm Chili for those brave souls whom like me crave spicy stuff... What do you all think? I have a MB unit and I also have the 5.27 app? If so, then today is my first. Now when will the new Chicken app be available so I can speed up again (no rush guys, but I am looking forward to it)? 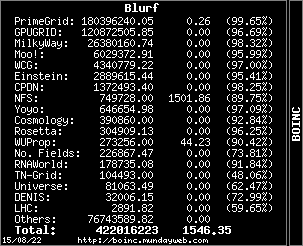 We've reached this phantastic milestone in BOINC just now! Message 618805 - Posted: 13 Aug 2007, 22:26:55 UTC - in response to Message 618740. I've had multiple near-2,000 credit days...I'm coming for ya! I had to post it now or put my machines on projects of less worth to avoid upsetting the totals, so now I'm off to work on Bio projects. Passed 2 million seti cobblestones while in LA for the last couple weeks. Caught 15 rainbow trouts each over 2 lbs also. I know it's a few days late... but I think a major SETI/BOINC milestone is the release of the new MultiBeam app. Congrats everyone @ SAH! A small one for me: 10,000 coblestones passed a couple of weeks back, didnt realise this thread was here to announce it! I got a little panicky when things went a bit funny with WU downloads the other week and added Rosetta into the projects to give my 3 crunchers something to do at least. GOing to stick the Rosetta on pause for now and go back to pure SETI. 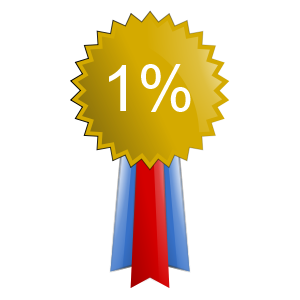 I dont have the crunching power behind me as I did for classic SETI (100,000+ WUs! ), so Im just going to see how far I can take this project. I have thought about building two quad core miniATX crunchers but I'm trying to clear my last 2000 UK of debt so that I can start saving and move out of a shared house into a place of my own! Congrats to My Team for going over 2 million credits total Boinc. Now on to 3 Million. 200,000 on SETI and in the top 700 for the team. One million (1,000,000) total across all projects.